The unusual ways to utilize your forklift. An inexpensive and fast way to move trailers with your fork lift truck. It quickly attaches to both pallet forks for stable load movement with safety chain and grab hook for added security per OSHA requirements. Accepts standard 2” hitch inserts desired to handle 1.875” to 2 5/16” hitch ball for up to 6,000 lbs gross towing weight, and with the pintle adapter, up to 16,000 lbs gross towing weight. Fork pockets 7.5" x 2.5" on 22" centers (Max 7" x 2.25" forks). Ships from stock. Convert your forklift into a swivel hook in a matter of seconds. 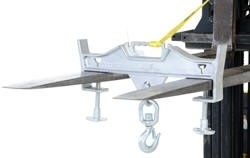 The easy to attach Hoisting Hook does not require the assistance of special tools. Secured to the forklift forks by means of a 36" long safety strap and screw clamps. The forklift attachment is zinc plated. Hook with shackle included. Capacity 10,000 lbs. Ships in 48 hours! Ships UPS. 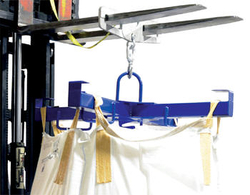 This handy device mounts either to your forklift forks or can be suspended from a fork hook or similar device to handle super sacks by the lifting straps. Why struggle with those ole bags? Powder coat finish, 4,000 lb capacity, overall size 40" x 40" x 13.75", weighs 97 lbs net. Ships LTL in 7-10 days. This hoisting hook automatically adds tension as weight is added. Can be used on forks up to 5" x 1¾". Yields a uniform capacity of up to 4,000 lbs. Swivel hook standard. Ships in 48 hours! Ships UPS. Convert your fork truck into a forklift mover for trailers and other portable equipment. Simple design slides onto forks and secures into place with safety pins. Welded steel construction with powder coat blue finish. Optional pintle hook, tow balls, and new TRI-BALL includes hooks available. Frame has a 4,000 lb capacity, total unit capacity may be less, depending on ball/hook selected. Ships in 7-14 days. Great new product designed to turn your fork truck into a floor scraper. Works well in paint and finish rooms for removing over-sprayed paint from floors. Simply slide fork tines into opening and attach chain to carriage for safety. Features hardened scraping blade for long life and durability. Blade is mounted in pivot assembly to allow it to raise up with contact against a crack or rise in the floor. Heavy-duty welded steel construction. Painted finish. Made to order in 2 weeks. The Lift-Master Hook Plate by Vestil enables any forklift to maximize safety while lifting a load using chains, cables or ropes. The safety chain and strap are used to secure the Hook Plate to the forklift, preventing it from sliding off the end of the forks. The 4000 lb model is constructed of 3/4" hot rolled steel. 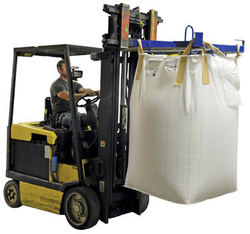 Additional 6,000 pounds capacity option is available for handling heavier loads. Fork openings are 6.25" x 1.75". Ships in 48 hours! Ships UPS. This product allows you to easily transport and rotate 55 gallon steel drums using a forklift. Drums are held securely in place by a durable chain locking system. Each unit is provided with a 15 foot long chain to allow the drum to be rotated up to 360° from the fork truck operator's seat. Fork pockets 7.5" wide x 2.5" high. Safety chain is used to secure unit to fork truck. Bung Nut Wrench, is also included for opening and closing drums. See Weblog 11/13/06 for pictures & descriptions of adapters & upgrades on this item. Ships in 2-3 days.